This user research summary is based on an article published as Schenberg EE, Alexandre JFM, Filev R, Cravo AM, Sato JR, Muthukumaraswamy SD, et al. (2015) Acute Biphasic Effects of Ayahuasca. PLoS ONE 10(9): e0137202. doi:10.1371/journal. pone.0137202. 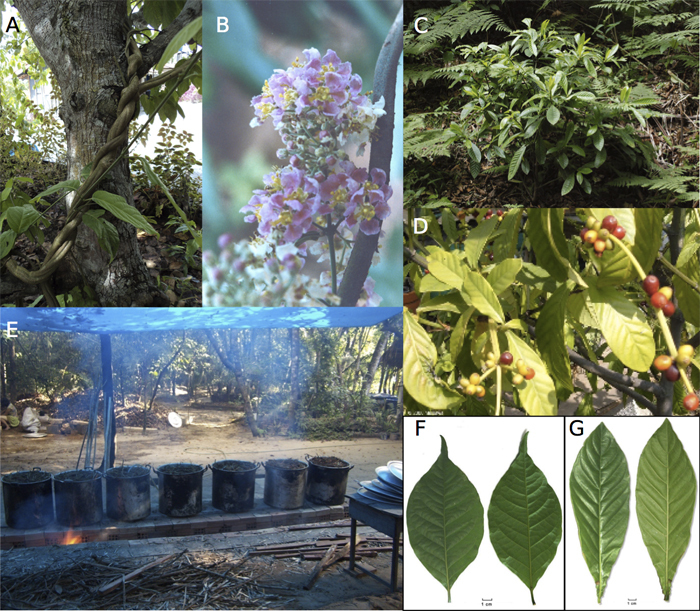 Figure 1: (a) B. caapi growing in front of a tree, (b) B. caapi flowers, (c) P. viridis shrub, (d) P. viridis leaves with fruits, (e) preparation of ayahuasca brew at a community in Alter do Chão, Pará, Brazil, in February 2010, (f) detail of B. caapi leaves, and (g) detail of P. viridis leaves. reproduced with permission from SAGE Open Medicine January – December 2013 vol. 1 2050312113508389. Ayahuasca is an amerindian psychoactive sacrament used worldwide (Figure 1). Neuroscience studies have shown contradictory results regarding its effects in the brain (Don et al, 1998, Hoffmann et al, 2001, Riba et al, 2002, 2004, Stuckey et al, 2005, dos Santos et al, 2012). 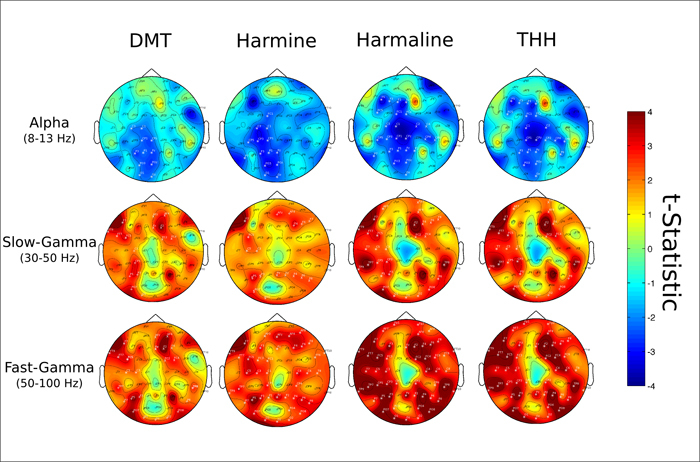 Combining EEG, plasma samples and robust statistics, we’ve uncovered biphasic effects in the brain which are related to many psychoactive compounds, not only N,N-dimethyltryptamine (DMT), as previously proposed. To achieve this breakthrough, we had to deal with a series of technological and conceptual challenges. Since we faced a situation involving an altered state of consciousness, which makes remaining quiet and immobile very challenging, we anticipated noisy signals. Ayahuasca’s effects last at least four hours, possibly more. Thus, deciding which segments to analyze and how to best deal with a large multidimensional dataset was an additional challenge (channels, time, frequency, and subjects as its four dimensions, plus the plasmatic levels of chemical compounds over time). Finally, what would serve as a control situation is not easy to define, because the very effects of the brew on the state of consciousness make subjects break blind, therefore rendering the canonical pharmaceutical double-blind design unsuitable. The solution to the above mentioned issues encompassed a series of specific techniques employed from recording to non-parametric “cluster” statistics, including broadband EEG recording at high sampling rate (2 kHz) without online filters and detailed pre-processing with independent component analysis (ICA). Twenty healthy volunteers (eight women, mean age, 29.0 years, SD, 3.7 years, mean weight, 55.7 kg, SD, 5.3; 12 men, mean age, 38.5 years, SD, 8.0 years, mean weight, 74.9, SD, 7.7) with previous experience drinking ayahuasca in non-religious settings gave informed consent to participate in the study. All procedures were approved by the Ethical Committee of Universidade Federal de São Paulo and the study was conducted following available guidelines for safety in human hallucinogen research (Johnson et al, 2008). A psychiatric assessment was conducted, volunteers disclosed their previous drug use histories and signed an informed consent. Exclusion criteria were as follows: < 21 years old, personal history of psychiatric illness, current use of any psychiatric medication, cardiovascular disease and any neurologic disorder or brain injury in the past. Women were asked to participate in the first 15 days of their menstrual cycle. To avoid broken-blind issues, we adopted a repeated measures design with subjects serving as their own controls. Therefore, we recorded EEG signals during 3 hours continuously, with subjects drinking a standardized dose of ayahuasca after 25 minutes of recording, with this first period serving as the baseline. At each 25 minute time interval we collected a small 3 ml blood sample to quantify chemical compounds in systemic circulation following published methodology (Mcilhenny et al, 2012). Volunteers were never left alone in the room, and they remained seated in a reclining chair. They were asked to remain in “resting-state”, i.e. quiet and introspective, with eyes closed. One researcher (EES) was sitting in front of the volunteer, carefully writing down any behavioral manifestation, movements or eye openings as well as following the EEG tracings in a notebook screen. The nurse was sitting by the side and the other researcher behind the volunteer’s chair. Two buckets were available in case of vomiting (a common effect after ayahuasca ingestion). 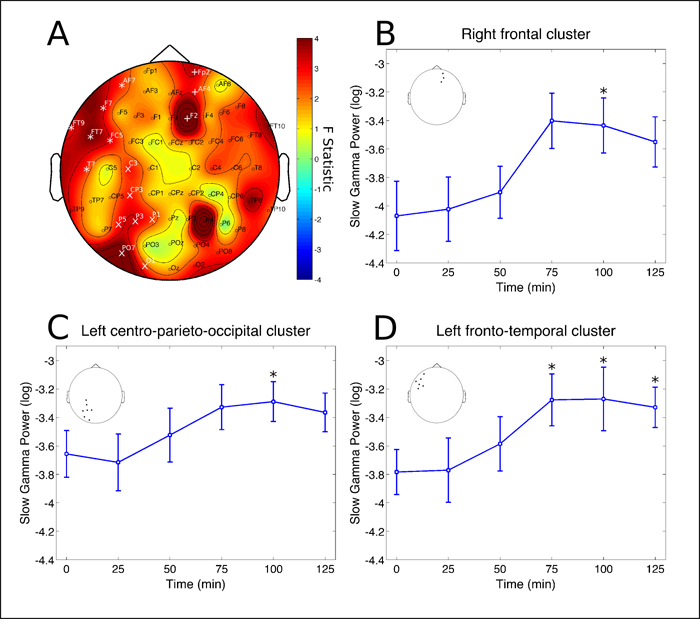 Electroencephalogram recordings were made for three consecutive hours using a BrainVision actiCHamp with 64 channels using the standard actiCAP active electrodes with PyCorder software. Recordings were referenced to Cz and re-referenced offline to the common average. Impedance was considered optimum if < 15 kOhm but still acceptable if > 15 and < 35 kOhm. This was achieved in 80% of the channels. Channels with impedance above 35 kOhm were marked for further offline evaluation. Sampling frequency was 2 kHz and no filters were applied during the recordings. To avoid line noise and other sources of interference, the whole setup (recording equipment and notebook) was only connected to an external battery independently of the power line of the building. Using MATLAB, data was divided in ten minute windows immediately preceding each blood sample collection. The first such segment was before drinking ayahuasca (T0, baseline) and the remaining after 25, 50, 75, 100 and 125 minutes from ingestion. These were preprocessed using EEGLAB v.13.3.2b (Delorme and Makeig, 2004). All recordings were downsampled to 500 Hz and bandpass filtered between 0.5 and 150 Hz with an FIR filter and subsequently visually inspected for identification and removal of bad segments due to movements. Bad channels, identified by visual inspection of the tracings and power spectrum, were removed and interpolated using spherical splines (Perrin et al, 1989). The remaining data were then segmented in 3 s consecutive epochs and all epochs with any discontinuity due to previous removal of bad segments were also excluded. The epoched data of each time window were then processed using the infomax independent component analysis algorithm (implemented as runICA in EEGLAB). Components with characteristic line noise (concentrated spectral peak at 60 Hz), muscle artifacts (elevated spectral power beyond 15 – 20 Hz and topographic distribution around the edges of the head) or eye blinks and eye movements (spectral peaks at very low frequencies, i.e. 1 – 2 Hz, and visible slow oscillations in the filtered tracings) were removed from the data. Special attention was given to components with characteristics of muscle artifacts, since it was difficult at times for participants to stay still during the effects of ayahuasca. After preprocessing in EEGLAB the data were exported to Fieldtrip (Oostenveld et al, 2011) for further spectral analysis and statistical procedures. The power spectrum was calculated with a hanning window for frequencies between 1 and 30 Hz and with slepian multitapers for frequencies from 30 to 100 Hz using ± 10 Hz smoothing (Mitra and Pesaran, 1999). The following six frequency bands were defined as of interest for further analysis: delta (1 – 4 Hz), theta (4 – 8 Hz), alpha (8 – 13 Hz), beta (13 – 30 Hz), slow-gamma (30 – 50 Hz) and fast-gamma (50 – 100 Hz). The main result was the observation that ayahuasca acutely induces a biphasic effect in the brain. The first phase occurred 50 minutes after ingestion and consisted of power decrease in the alpha frequency (8 – 13 Hz) at left parieto-occipital channels (Figure 2). Figure 2: Alpha rhythm cluster. Changes in alpha frequency band power spectrum over the 2 hours since ayahuasca ingestion. 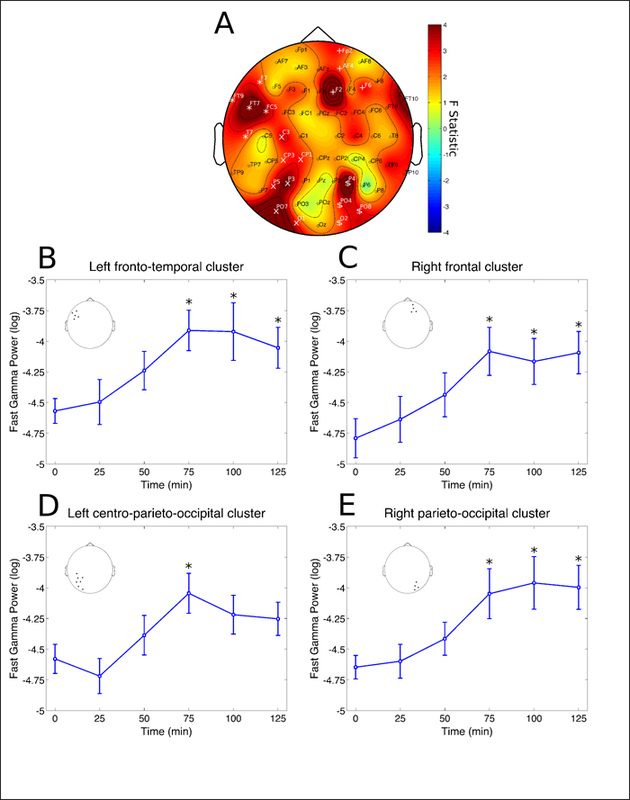 A) F statistics in the entire scalp revealed a significant cluster at left parieto-occipital electrodes (P7, PO7, O1 and Oz, p = 0.0398, highlighted by white *). B) Post-hoc analysis revealed decreases in the cluster depicted at left to be significant after 50 minutes from ingestion of ayahuasca (*p<0.05, corrected). Inset highlights the electrodes averaged for the post-hoc analysis, in correspondence with A. Data in B is expressed as mean and standard error. The second phase happened between 75 and 125 minutes after ingestion, characterized by power increases in the gamma range, both for slow-gamma (30 – 50 Hz) as well as fast-gamma (50 – 100 Hz), at parieto-occipital and frontal sites bilaterally (Figures 3 and 4). Figure 3: Slow-gamma rhythm clusters. Changes in slow-gamma frequency band power spectrum over the 2 hours since ayahuasca ingestion. A) F statistics in the entire scalp revealed three significant clusters at the right frontal (Fp2, AF4 and F2, p = 0.0046, highlighted by white *), left centro-parieto-occipital (C3, CP3, P5, P3, P1, PO7 and O1, p = 0.0152, highlighted by white x) and left fronto-temporal (FT9, AF7, F7, FT7, T7 and C5, p = 0.0026, highlighted by white +). B) Slow-gamma band power increases at right frontal cluster were significant only after 100 min from ayahuasca ingestion (*p < 0.05, corrected). C) Slow- gamma band power increases at left centro-parieto-occipital cluster were significant only after 100 min from ayahuasca ingestion (*p < 0.05, corrected). D) Slow-gamma band power increases at left fronto-temporal cluster were significant after 75, 100 and 125 minutes from ayahuasca ingestion (*p < 0.05, corrected). Insets in B, C and D highlight the electrodes averaged for each post-hoc analysis, in correspondence with A. Data in B, C and D is expressed as mean and standard error. Figure 4: Fast-gamma rhythm clusters. Changes in fast-gamma frequency band power spectrum over the 2 hours since ayahuasca ingestion. A) F statistics in the entire scalp revealed four significant clusters at right-frontal (Fp2, AF4, F2 and F6, p = 0.0016, highlighted by white +), right parieto-occipital (P4, PO4, O2 and PO8, p = 0.0088, highlighted by white $), left fronto-temporal (FT9, F7, FT7, FC5 and T7, p = 0.0098, highlighted by white *) and left centro-parieto- occipital region (C3, CP3, CP1, P5, P3, PO7 and O1, p = 0.0132, highlighted by white x). B) Fast-gamma band power increases at left fronto-temporal cluster were significant after 75, 100 and 125 min from ayahuasca ingestion (*p < 0.05, corrected). C) Fast-gamma band power increases at right frontal cluster were significant after 75, 100 and 125 min from ayahuasca ingestion (*p < 0.05, corrected). D) Fast-gamma band power increases at left centro-parieto-occipital cluster were significant only after 75 min from ayahuasca ingestion (*p < 0.05, corrected). E) Fast-gamma band power increases at right parieto-occipital cluster were significant after 75, 100 and 125 min from ayahuasca ingestion (*p < 0.05, corrected). Insets in B, C, D and E highlight the electrodes averaged for each post-hoc analysis, in correspondence with A. Data in B, C, D and E is expressed as mean and standard error. These qualitatively distinct phases in the brain’s “resting-state” oscillations nicely followed circulating levels of ayahuasca’s main compounds, i.e. DMT and the beta-carbolines, harmine, harmaline and tetrahydroharmine. Corroborating previous pharmacokinetic studies, DMT and harmine reached their maximum concentration first, during the first phase of alpha power reduction, while harmaline and tetrahydroharmine peaked later, during the gamma reductions. By combining non-parametric cluster statistics with generalized linear models we were further able to show significant associations between EEG changes in many different channels with circulating levels of these four chemical compounds (Figure 5) plus some of their metabolites. This analysis revealed that the psychoactivity of ayahuasca cannot be solely explained by the central actions of DMT, as proposed in the current model for explaining ayahuasca’s pharmacological mechanism of action. Figure 5: Active compounds’ concentration and EEG effects in alpha and gamma rhythms. Statistical associations between plasma levels of DMT (first column from left), harmine (second column), harmaline (third column) and tetrahydroharmine (fourth column) with alpha, slow- and fast-gamma frequency bands. Ayahuasca is a psychoactive brew most commonly made with the root of Banisteriopsis caapi and leaves of Psychotria viridis. Indigenous tribes that developed this concoction and its first ritual uses call B. caapiand the brew by ayahuasca. This quechua word means “vine of the soul”, indicating this is the main plant in the preparation. Biomedicine, on the other hand, has focused almost exclusively on the actions of DMT, which comes from P. viridis, to explain ayahuasca’s effects in the brain. Here we show that betacarboline’s are also related to the brew’s psychoactivity and that therefore ayahuasca cannot be comprehensively studied following a single active principle reasoning. Furthermore, the modified state of consciousness achieved with the ingestion of ayahuasca results from complex alterations in brain oscillations in many different regions of the cortex, being composed of at least two qualitatively distinct phases, which illuminates the ayahuasca experience diachronically. Hoffmann E, Hesselink JMK, Barbosa Y-WDS. Effects of a Psychedelic, Tropical Tea, Ayahuasca, on the Electroencephalographic (EEG) Activity of the Human Brain During a Shamanistic Ritual. MAPS Bulletin. 2001 Jun 19; 11(1):25–30. Stuckey DE, Lawson R, Luna LE. EEG gamma coherence and other correlates of subjective reports during ayahuasca experiences. J of Psychoactive Drugs. 2005 Jun 1; 37(2):163–78.